A global leader in bulk material handling technology has announced a secondary conveyor belt cleaner engineered to improve performance and reduce maintenance time, even as average belt speeds and loads continue to increase. The Martin® SQC2S™ Cleaner features individually cushioned tungsten carbide blades for effective cleaning without risk to the belt or splices. The new design forms a single sealing edge that maintains steady, adjustable pressure. 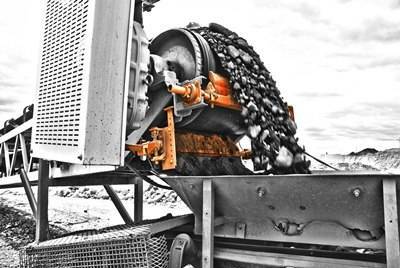 Patented rubber buffers maintain the cleaning pressure throughout the blade’s life, while deflecting sufficiently to allow splices to pass without harm and ensuring compatibility with reversing belts or those that experience backup at shutdown. Moving parts are zinc plated to resist seizing or rusting. The rugged construction is engineered to withstand punishing conditions, such as high belt speeds, high-impact transfers and high tonnage loads. Designed for a maximum belt speed of 1000 fpm (5.08 m/sec), the cleaner is suited for belt widths from 18 to 96 inches (~400 to 2400 mm). To match the requirements of specific applications, the unit features straight 5.91 inch (151 mm) individual blade sections or 3 inch (76.2 mm) individual blade sections, attached to a sturdy square mainframe. Replaceable urethane blades are color-coded according to their continuous temperature rating, ranging between -40° to 350°F (-40° to 177°C). Tungsten carbide tips can be specified for normal, acidic or high-impact conditions. The rubber wear strip is supplied in continuous lengths up to 100 feet (30.48 m). Blade removal and replacement is a simple operation on the SQC2S by removing the lock pin from the main assembly and sliding out the cartridge. The lock pins are a key component to Martin Engineering’s “no-reach design,” which allows workers to conduct their lockout / tag-out procedure more safely. This innovation is one reason why the unit is a member of Martin Engineering’s Safety First™ family of products, helping customers achieve OSHA compliance. Founded in 1944, Martin Engineering is the world leader in making bulk materials handling cleaner, safer and more productive. The company supplies conveyor products and flow aids around the world for a wide variety of bulk material applications, including coal, cement, aggregate, biomass, grain, pharmaceuticals, food and other materials. The firm is headquartered in Neponset, IL, offering manufacturing, sales and service from factory-owned business units in Brazil, China, France, Germany, Indonesia, Mexico, South Africa, Turkey, India and the UK, and under exclusive license with ESS Australia.